That was a pretty epic party, right? 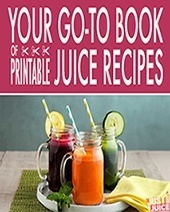 But now you’ve typed ‘juicing for hangover’ into Google ’cause you know it’s time to get back to real life – and you know you can’t go into that meeting wearing sunglasses and clutching your head. So where do you turn for quick and easy hangover solutions? 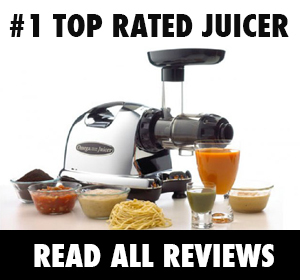 To your trusty juicer. And of course, fresh fruits and veggies are chock full of vitamins, minerals and enzymes that can kick your sluggish system back into gear. So let’s get to making some hangover juice! But first, let’s take a moment to talk about how we can prevent you returning to this article the next time you’ve had a little too much to drink. If you find yourself moaning “why did I drink that? !” the problem may not lie in what you drank, rather how you drank it. There are a number of things you can do to prevent that next-day hangover and still have a great time. Yes, we know – these hangover prevention tips are a little too late this time but hey, next time you’ll be prepared! Hangover prevention juice. Yes! This is actually a thing! A 2015 article in the Independent claims that pear juice may just be the perfect cure. Or rather – prevention. In order for pear juice to reduce hangover symptoms, it must be consumed before drinking alcohol. One reason is that pears work as an anti-inflammatory, and experts believe that hangover symptoms are caused by low-grade inflammation. Also, the Korean pear works by speeding up alcohol metabolism and inhibiting alcohol absorption. Studies showed reduced blood acetaldehyde levels, which may be responsible for hangover symptoms, with pear juice consumption. So whip up a pear juice recipe or two before you head out for drinks next time around. Avoid drinks high in congeners. Congeners are naturally occurring compounds that appear in alcoholic beverages during the distilling and fermenting process. Studies have found links between these toxic chemicals and the severity of hangovers. If you’re committed to getting through tomorrow without a nasty hangover, stay away from whiskey, cognac, and tequila (especially bourbon whiskey!). Stick with clear drinks, like vodka, gin, and rum. Drink coconut water. That’s right, fill your flask with coconut water, and sip from it regularly. Alcohol is a diuretic, meaning, it makes you pee. When you drink too much alcohol you may be in danger of becoming dehydrated. Coconut water, dubbed “nature’s sports drink,” has the electrolytes (sodium, potassium, calcium, magnesium, and phosphorus) you need to keep hydrated while you party on. Let’s say, after all these hangover-prevention methods you still wake up with a pounding head and a nauseated feeling in your belly, the light in the room is the light of a billion suns, and you’re just not prepared to take on the day. Sure, the last thing you want to consume right now is grass but this type of grass is amazing for curing a hangover and providing protection against liver damage. Not only does wheatgrass have an amazing amount of alkalinity that can help offset the acidity buildup created by consuming alcohol, it’s also one of the best liver loving superfoods and helps to detox and replenish this vital organ. In fact, a 2014 study in the Journal of Membrane Biology showed that wheatgrass could protect the liver against the detrimental effects of alcohol! 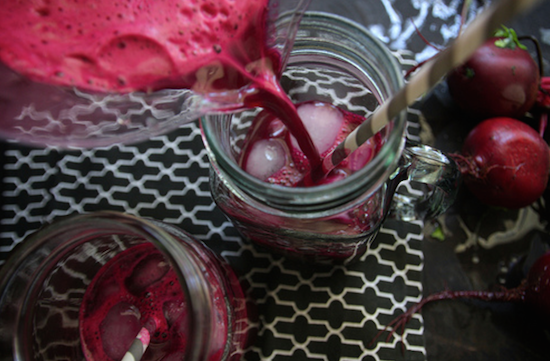 Beets help along the detoxification process with an antioxidant called betalains which repair and regenerate liver cells. Since the liver is the detox-center of the body, it can definitely use a boost after a toxic night. Ginger will calm and angry gut. It is a well-known remedy for nausea due to motion-sickness, pregnancy, and other types of upset stomach. The best way to juice it? Add the ginger to your juicer first, followed by the other ingredients. Spinach, kale, collard greens – they’re all rich in folic acid, sulfur, and vitamin C – which can help your body heal and get past the hangover symptoms fast. Not to mention, leafy greens like watercress, parsley and cilantro are renowned for their detoxification properties. Oh, parsley is also a natural diuretic that will help flush your system. Other diuretics you can use? Try fennel, cucumber and watermelon. Speaking of watermelon, this juicy, sweet fruit is 92% water which is necessary to stay hydrated. It contains electrolytes potassium and magnesium, as well as L-citrulline, an amino acid that improves blood circulation. Better circulation means more oxidized blood cells, which quickly repair muscle damage and assist in the detoxification process of the liver. Tomatoes are high in antioxidants, and give the liver a boost. When the liver is in full working condition it can more easily process all those toxins that are overloading your system. Tomatoes contain sodium and potassium, important electrolytes which are needed to cure that pounding headache. While you let loose last night, your liver was hard at work flushing out those toxins from the alcohol. If you’re hungover, your liver is tired. Lemon contains an important antioxidant d-limonene (found in the peel) which will give your liver a helping hand and move the detoxification process along. Okay, so admittedly, bananas are not juicer-friendly, because they don’t have that much juice. Pop a potassium-rich banana into your blender along with your just-juiced juice, and you’ll be feeling better in no time. Potassium is an important electrolyte that is probably depleted from your post-party body. Your body is weak and your immune system is compromised when you have a hangover. Blueberries contain a compound called pterostilbene which, according to Oregon State University, will give your immune system a boost. 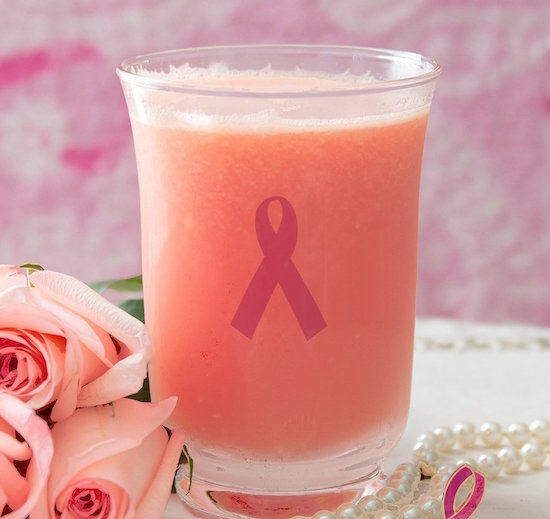 There is no better boost for a compromised immune system than a little—or a lot—of vitamin C. Guava holds record for fruit with the highest concentration of vitamin C. 100g of this tropical fruit provides 228mg of vitamin C, or 396% of your daily recommended intake. Your body is low on energy and in need of fructose—a sugar found in fruit—for a boost. The fructose may help to increase the rate at which the body flushes out toxins. Mango is one of the fruits with the highest amounts of fructose. It is also high in vitamins A and C, and provides dietary fiber. 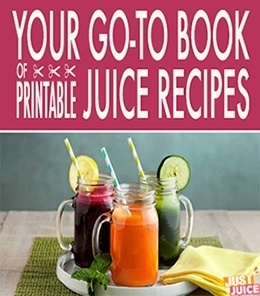 Ready to juice? We picked some of the most potent and nutrient-dense hangover recipes for you to get back to tip-top shape fast! 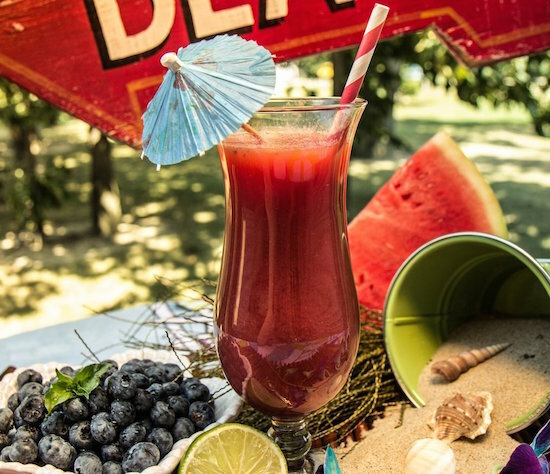 This is the perfect hangover juice to sip on the morning after, before breakfast. It’s nourishing, chock full of vitamins and just sweet enough to make your tastebuds very, very happy. Quick tip: The recipe is sweet enough with just the beets so you can feel free to skip the apples (or replace them with cucumbers) if you want a low sugar hangover cure. 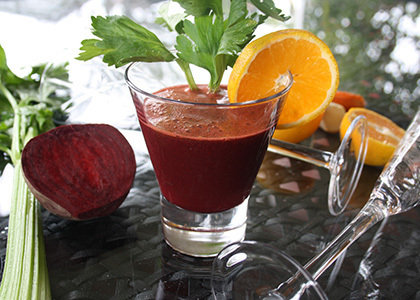 Another very simple hangover juice recipe that’ll take just a few minutes to whip up! This is so simple and so very hydrating – the perfect thing to sip on all day, especially since it’s rather low in sugar as well. Here’s a hangover green juice that’s the perfect amount of “green-ness” – great for beginners as it’s not overwhelming at all. Yes, this hangover juice recipe requires quite a few ingredients but it’s oh, so worth it. This one’s packed with celery, a natural diuretic to speed up the detox process as well as Vitamin C-rich orange and lemon. 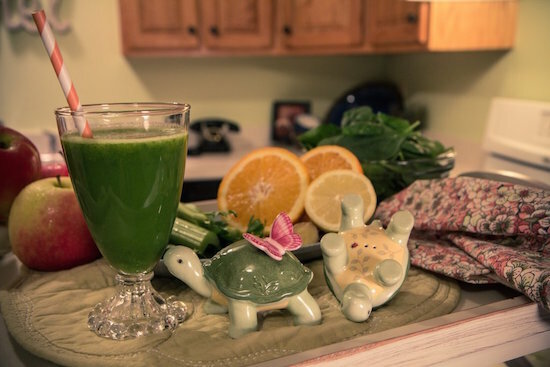 Ginger gives it a lovely, nausea-fighting zing and you even get a huge dose of greens with the spinach.